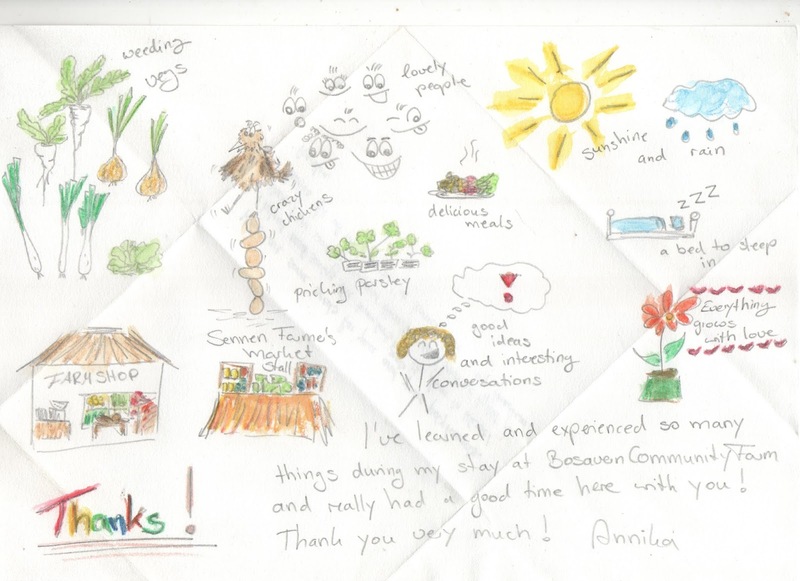 Annika, from Germany, left this morning for her next farm after wwoofing with us 2 weeks, and left us this lovely letter with drawings which we'd like to share with you - many thanks Annika for you help! This year's hay is now for sale at the farm, at a very competitive £3 per small bale. Please pay in the farm shop. Local delivery may be available if requested, for a small charge. and Pendeen, in the Centre Of Pendeen, 10:00-13:00 every first and third Saturday of the month. 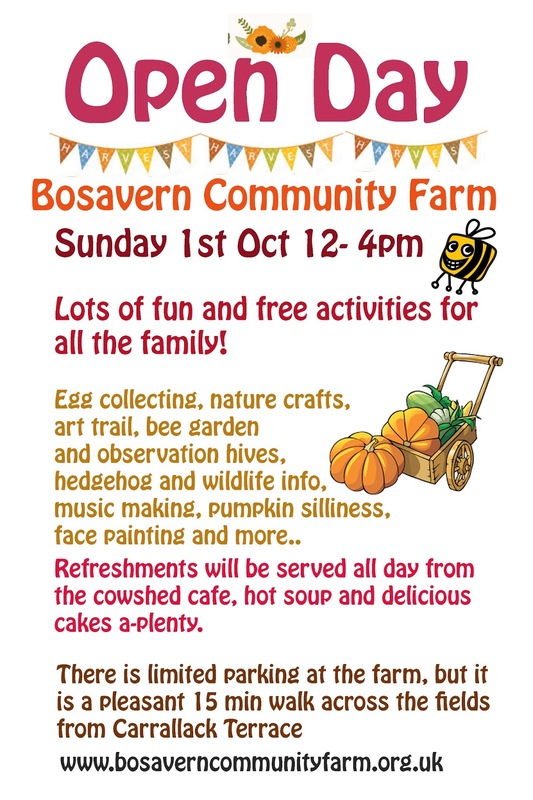 We are one of many stalls at these markets, with other stalls selling bread, raw chocolate, cheese, meat, curry sauces, crafts, jewellery, books, pies, cakes, quiches, jams, chutneys, soaps, chilli sauces, smoked fish, upcycled furniture etc.... 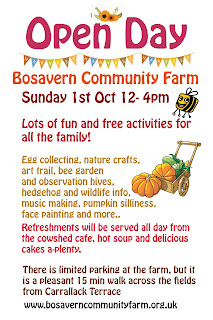 Please come along and support your local producers and artisans, and support your communities and the local economy. Each market also has a seated cafe, with cakes and tea and coffee. Small veg box (£6) - red Russian kale, red peppers, purple-top turnips, carrots, Charlotte salad potatoes, and courgettes. The standard veg box (£10) contained all of the above, plus leeks, mixed herbs, onions, and tomatoes. Another batch of lovely wwoofers have recently left the farm - Caroline from Johannesburg in South Africa, Tasha from Gloucestershire on her second stay with us this year, Barbara from Austria, Larissa from Germany, and Will from Bristol. Lots of thanks and good wishes go from all of us to all of them! Caroline (left) and Tasha in the farm shop. Barbara (left) and Larissa in Home Field. Will feeding old bread to the farm's chicken flock. The team of four wwoofers who helped us during hay harvest (and a lot more besides) have all left the farm over the weekend. Bethany (from Falmouth, on her third visit), Celine (from France), Martin (from Germany), and Mira (from Italy) all came to the end of their volunteering stays with us, and we thank them for their hard work and commitment during their time at the farm. Standard veg box for £10 (or £11 delivered to your door) - Charlotte salad potatoes, mixed salad leaves, French beans, ring-of-fire chillies, courgette(s), pepper(s), red Russian kale, rainbow chard, leeks (from Cargease Organics), and a sprig of Vietnamese corainder. Our small veg box for £6 (or £7 delivered), contained the above minus the salad, beans, leeks, and chard.